Being a food blogger is a unique online task. When I first started this blog I had no idea what I was doing. I knew that I loved cooking and hated trying lots of recipes that didn't turn out as I expected. I'll admit the first year was rough. It took me over six months to get a rhythm and blogging style. My pictures the first year were hit or miss as well. Some photos turned out great, others not so much. Then over the summer I decided that I needed to up my blogging game. I started spending more time on my photos and making a commitment that I would post regularly. I also accepted that food blogging can be very trying. Not only do I have to prepare the meal plans, cook the recipes, and take the food photos, but I also have to find a way to relate everything back in a blog post that I hope someone will want to read. A food blog can definitely lead to burnout. It can also be a lot of fun and I love it. I think the one thing that readers often are confused by is why I don't have photos of myself online. I never have even on my private Facebook page. I prefer to keep my online and offline lives separate. The rise of television cooking shows has made foodies overly personal image driven, which to me defeats the purpose of the food. At the end of the day I am the food that I cook and the words that I write. Hopefully that is enough to make a few people keep coming back. Now back to the point, the food! Last week I tried a new recipe for Apricot Chicken from All You magazine, which with only 7 ingredients looked simple and delicious. This recipe has 7 ingredients. It takes 4 hours and 10 minutes of cooking time, 15 minutes of prep and makes 4 servings. I had no problems finding any of the ingredients at my local grocery store. As I have talked about numerous times before I used homemade chicken stock. It took me longer to brown my chicken than the suggest 3-5 minutes per side by the recipe. I prefer my chicken to be decently browned to prevent sogginess in the crock-pot. My total time for browning was approximately 15 minutes. I also allowed the onions to fully brown before placing them in the slow cooker. My husband has a thing against non-caramelized onions in the crock-pot and won't eat them. I followed the remainder of the recipe as written. My family really enjoyed this recipe. The taste is simple and great for picky eaters since there aren't any spices. If you are looking for a dish with a lot of spices and undertones this recipe isn't for you. However, if you are looking for a recipe that is simple enough for a weekday meal and pleases even young picky children this dish is perfect. I also like that it has 32 grams of protein per serving, which is great for my two growing boys. 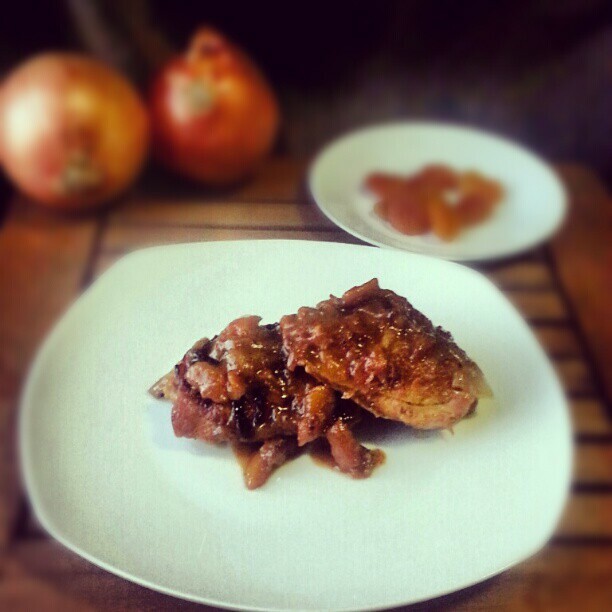 For the recipe go to Slow Cooker Apricot Chicken. yes please. seven ingredients sounds so perfect. Thank you so very much for joining us last week for An Aloha Affair. Thank you for sharing your sweet energy with us. This week's An Aloha Affair is now live and I hope that you'll join us again in between holiday prep and such... I hope too that you know... I am oh so very thankful for you! I love that you can devote your blog to cooking. When I decided that I would like to write a blog, I looked at specializing. I realized that I am just not that good at any one thing, and that everyone would be bored if I just wrote about crafting or cooking. I am a pretty boring cook, so I take inspiration from your blogs. Thank you for taking the time you do to write them. Thanks :) I try with my pictures, they are getting better each day. I'm glad that you visit and are so great with your comments!